For the visitors of the Hotel Faraggi, the area offers many leisure activities. Nature lovers can enjoy wonderful walking and hiking trails, from the nearby gorge of Vikos until the legendary Drakolimni. Fishing and rafting in Voidomatis, mountain biking and horse riding can be added to their interests. The more adventurous people can take kayak lessons in Aoos, climb or do paragliding. And of course, for those who love skiing, ski center of Vasilitsa is about an hour from the hotel. Water activities (kayak, rafting). Aoos and Voidomatis are ideal for rafting and kayak and have easy and difficult paths that reach a length up to 27 km. In Voidomatis, classic route starts from the bridge of Aristi (Papigo), follow a green path in the gorge of Voidomatis and ends at the exit of it, at the bridge of Kleidonia, next to the hotel. In Aoos, in the most famous way starts from the bridge of Aoos between the villages of Palaioseli and Vrisohori and ends at the bridge of Konitsa. Mountain biking and horse riding. The area around the hotel is ideal for cycling. We can recommend several routes, easy and difficult. Also, an excellent choice is a ride with a horse in the surrounding area. Paragliding. Near the town of Konitsa, at the hill of Prophet Ilias, there is a formed taken off rack for paragliding. Here world cup games of paragliding are held. Climbing. From the mountains of Konitsa, rocks of Timfi are offered for climbing and even are one of the most important and difficult climbing fields in Greece. Several climbing routes have been engraved in them, which include a variety of levels of difficulty. Fishing. Fishing lovers are in the perfect place! In the crystal clear waters of Voidomatis, that is the cleanest river in Europe, live trout. 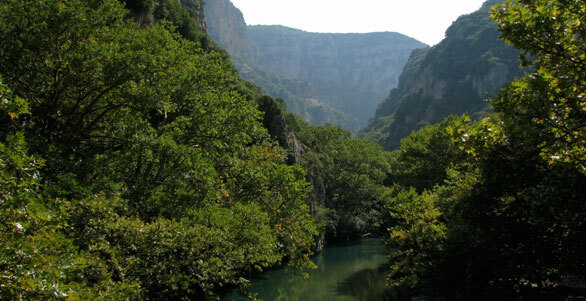 From 15 March to 30 October in Aoos and Voidomatis fishing is permitted outside of the National Park of Vikos – Aoos (no fishing license is needed). Ski in Vasilitsa. The ski center of Vasilitsa is about an hour from the hotel. It has two chalet and 18 ski slopes (2 of Olympic standards).